Sir Harold Wernher, 3rd Bt., G.C.V.O. (1893-1973), Bath House, London, and from 1948, Luton Hoo, Bedfordshire, and by descent. 1913 Luton Hoo Inventory, p. 26, no. 106, in the Grand Hall, 'in cabinet'. 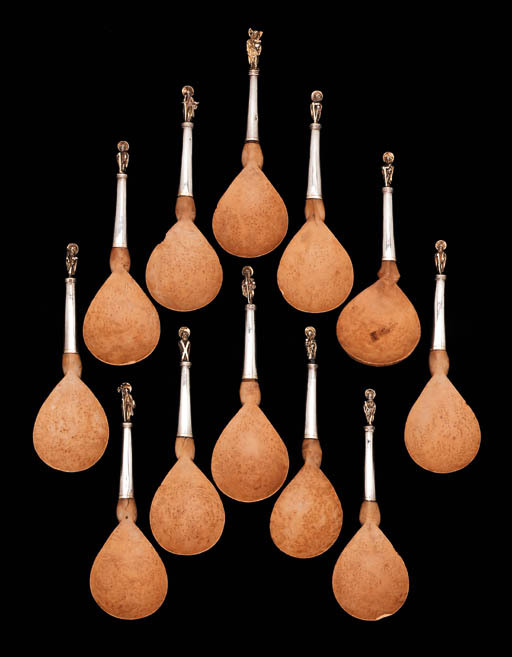 A group of ten boxwood spoons with bowls of similar form to those on the present set formed part of the Amerbach-Kabinett and are dated to circa 1550 (F. Ackermann, Sammeln in der Renaissance Das Amerbach-Kabinett, Basel, 1991, p. 77, no. 58). A set of Swiss seventeenth-century casting moulds for apostle finials of very similar type to the present example are also recorded (E.M. Lösel, Zürcher Goldschmiede Kunst, Zurich, 1983, p. 396, fig. 171). However the form was also used by German silversmiths of the period.